BlackBerry Z10: is it the rejuvenation RIM needs? Finally, after many rumours, leaks and apparent specs, the BlackBerry Z10 has been released at BlackBerry’s own event. The hardware on the device has been rumoured for a while now and most of the leaks had truth to them. The main feature that separates the BlackBerry Z10 from other devices is the new BB10 operating system. RIM did say that they were going to make the operating system more optimised for touch screen devices and they have been true to their word. The BlackBerry Z10 is a 4.2-inch, 1280 x 768 LCD screen, colour clarity and reproduction seems impeccable even better than the 1080p displays that some Android manufacturers have released. Designing the phone, RIM has obviously looked at the top guns to take their points. They have also not strayed too far from normality, not going for an odd-phablet design or a screen so small it will lack appeal. The phone comes in black or white and looks, to the modest eye, a very sleek and well designed device. The phone has a 1.5GHz dual-core processor, RIM has yet to announce the processor manufacturer or model. This comes with 2GB of RAM and 16GB of inbuilt storage. The storage can be bumped up to 48GB with a 32GB microSD card, if the need arises. The BlackBerry Z10 has a eight megapixel rear camera and a two megapixel front camera. The back camera can take very clear shots, although the interface may take some getting used to if you are a previous iOS or Android user. BB10 is a whole new operating system that slides away from the predecessor. RIM really wanted an operating system that was gesture based and they got it, although we wonder how simple it is to use for a novice. The BlackBerry Z10 is a well polished, new, very improved device by BlackBerry. We extend that this may be the lifesaver, although there are still some tinkers in the operating system that need configured. 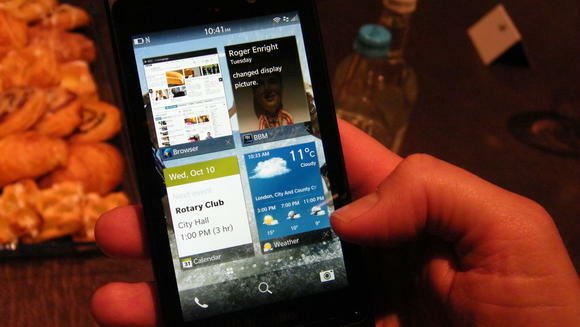 What BlackBerry 10 lacks is any reason why you would switch, if you already have a great Android phone or iPhone.